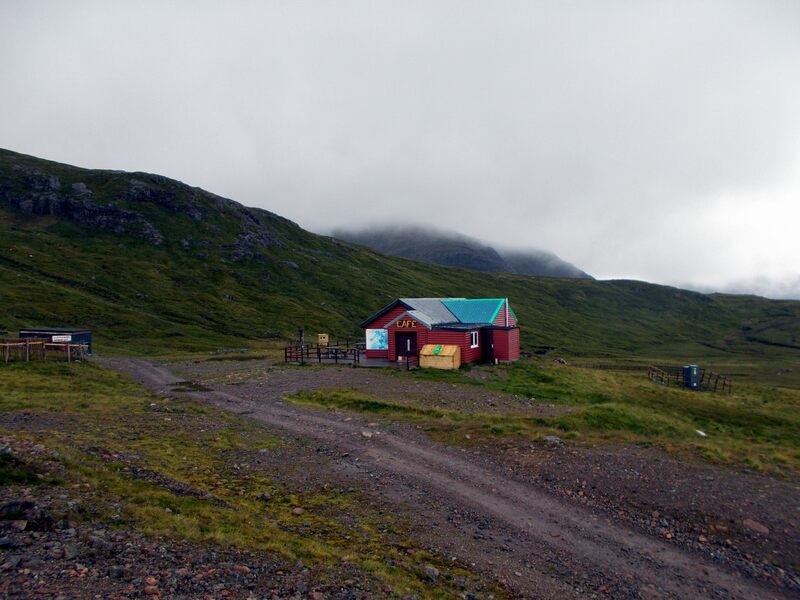 The Plateau Cafe – despite being closed – served as a kind of advanced base camp today; its walls giving some shelter from the rain bearing westerly winds that swept across the Highlands from the North Atlantic. 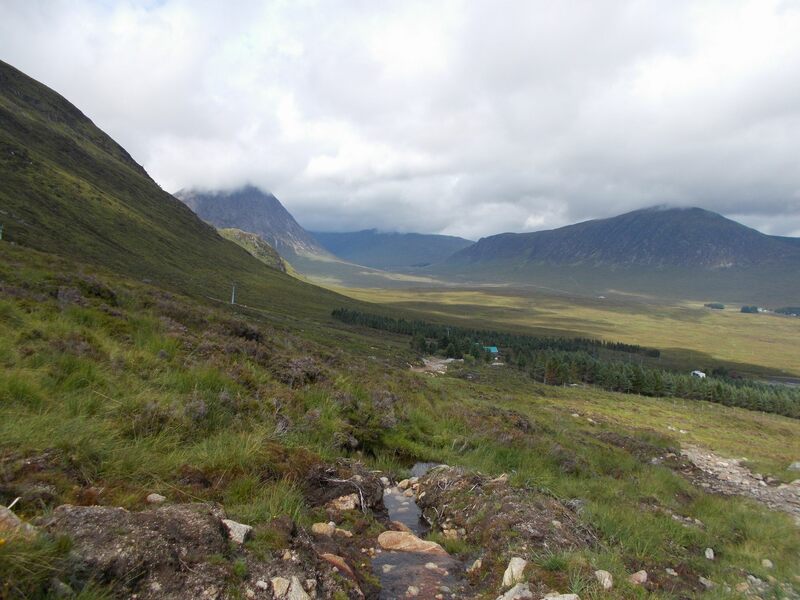 I had walked up a trail that doubles as one of the downhill mountain bike tracks from the Glencoe Mountain Resort aka Glencoe Ski Centre in somewhat better conditions but I was now debating whether or not to carry on. 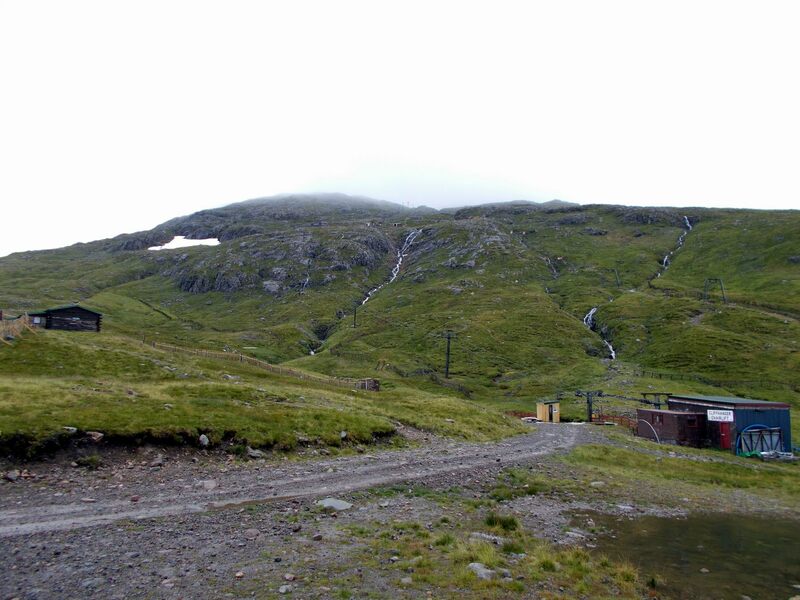 The aim had been to climb the Munro called Meall a Bhuiridh – the highpoint of the Blackmount range southeast of Glencoe – before crossing a short high ridge to ascend Creise – a second Munro – and Clach Leathad but the weather was suggesting that the Kingshouse pub would make a better choice. My current indecision resulted in having an early lunch on the lee side of the building and by the time I had finished the weather seemed to have abated a little so I took the decision – as is common in the mountains in dubious conditions – to go up and see. I was surprised that there was no clear path or indication of the route on a peak with chairlift access to over 2000 feet but the way looked obvious enough. Beyond the base of the nearby ski tow a half collapsed bridge led over the river and a faint path was picked up that climbed a grassy rib ahead. It was an easy way up and most of the crags lay over to the left where a vast gully split the mountain below a mid-way hut visible above – the top of one of the ski tows. Above that cloud cloaked the mountain and hid the route though the map showed the easier ground to be up to the right or west. As I climbed the route became more interesting; heading up the side of a narrow gully above a stream that cascaded down out of the mist. Keeping on the left of the stream was easier and I reached the midway hut sooner than expected. 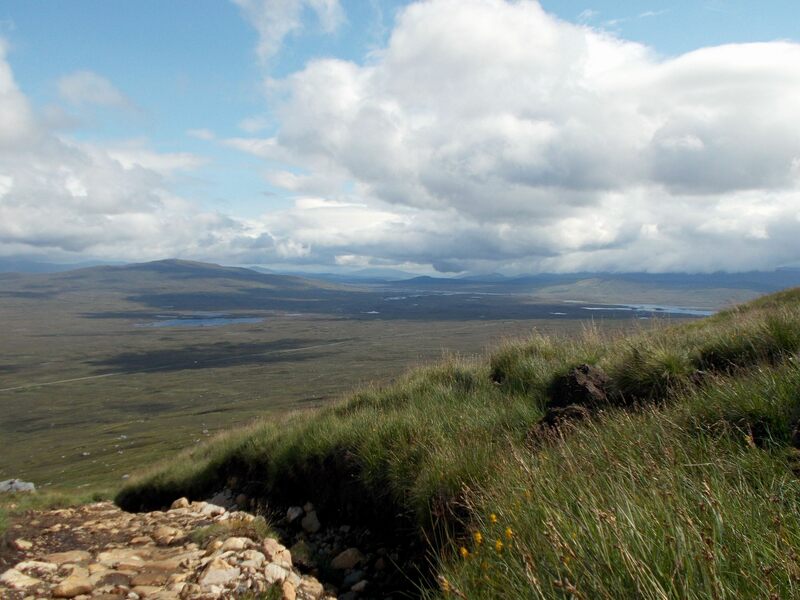 Here the route of a ski run climbed gradually to the right and crossed onto grassy slopes that made the broad north ridge of Meall a Bhuiridh. This way avoids all crags and the much bigger gully I’d seen earlier – probably best when you can’t see the route ahead too far. Heading onto the western side of the mountain brought me back into the wind again and with the path fading in and out I climbed to the left up the wide undefined ridge. On up through rockier ground and finally more steeply but on a clearer path up a long slope of shale and stones in steadily deteriorating conditions. It was now cold too and visibility was down to ten metres – this incidentally is why there are no photos of the upper of the route – I was not actually in the Kingshouse as some may be thinking. Out of the storm a sign announced one word “Danger” this was to ensure skiers turned here and did not continue over the edge and plummet out of control into the corrie on the west of the peak. Then there was a cairn and the path stopped going up. I had climbed my Munro but would be going no further today. The height was 1108m – 3636ft – and the temperature seven degrees C (45F) though it felt much colder in the wind and driving rain. The path I would have taken headed right down a narrow ridge while leftwards just beyond the summit and slightly lower was the top of the ski tows in a stony hollow. I suppose it all looks a bit smoother when it’s covered in snow. 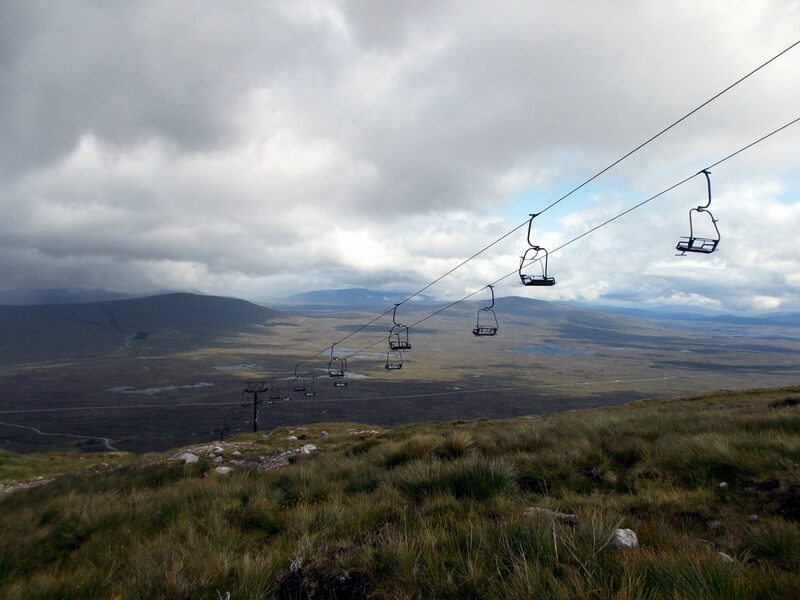 Back down it was then in horizontal rain and gale force winds to the Glencoe ski centre where there was at least a semblance that it was still August and not November. On a nice day this would be a pleasant and fairly easy ascent – easier still if you use the chairlift – of 9km (just under six miles return) from the ski centre car park or in my case from my tent. Today it was still 9km but it seemed a lot further. The photos are from the part of the route where I still had a view. As for the ski Centre, the car park is free and there’s a cafe that serves reasonably priced food. They also hire mountain bikes for those brave enough (not me) to tackle the downhill runs! This entry was posted in outdoors, Scotland and tagged hiking, landscapes, mountains, nature, outdoors, photography, random, Scotland, travel, writing. Bookmark the permalink.